My research on Ancestry.com and Familysearch.org had provided me with a lot of secondary sources that cited the death of JPJ, but it was imperative that I find his obituary. The reason was two-fold: An obituary, also known as a death notice, is what genealogists define as a ‘primary source’. which guarantees that my research is up to snuff. More importantly, I knew it would provide the answer I’m most compelled to find – does the man from the suitcase have any surviving relatives? It’s important to me to find someone in John’s family that might treasure the artifacts he left behind. I hate to think that these items may have been abandoned by mistake. Of course, it’s entirely possible that they have no value to anyone but me. A brief history of the obituary: The obituary as a standard feature of news publications started in 17th century England, but became popular in the United States in the 19th century. Published obituaries of the 19th century were typical for prominent members (translation: male members) of the community and focused on character traits. They did not detail the cause of death, preferring euphemisms to avoid the macabre. In fact, the root of the word obituary is a common euphemism for death, coming from the Latin obitus, meaning ‘departure’. The Funeral Consumer’s Information Society, (who, in my opinion, could stand to work on their name a little…who exactly are the consumers of funerals?) cites that in the early 19th century there was a brief period of rhyming obituaries. I applaud this, as I believe all people benefit from a moment of quirky creativity in their day, especially if your job is to pen obits for the local rag. The result of the obituary verse period, aside from the neurological benefits of all those creative synapses firing, is that we are left with this little gem from the March 17th, 1917 edition of The Delaware Gazette (Ohio). A tribute to Guy Swain, who fell to his death while trying to chase a raccoon from a tree at night. Nearing the turn of the 20th century, the focus shifted to a man’s accomplishments. Newspapers published lengthy memorials to famous figures as a way to boost circulation. P.T. Barnum’s obituary, published on April 8th, 1891 in the New York Times, ran 6347 words. I highlight P.T. Barnum as during my obituary research (which can get quite macabre if you follow too many links on the internet) I was delighted to find out that he had requested that his obituary appear in the paper before he died so that he could read it! The New York Evening Sun obligingly printed his obituary on March 24, 1891, two weeks before his actual death. His memorial in the Sun was titled The Great and Only Barnum – He Wanted to Read His Obituary – Here It Is. Today, there are no rules. The modern obituary can be as flowery and euphemistic as their Victorian counterparts or as direct as a bumper sticker. Meet a man who embraced Shakespeare’s proposition that brevity is the soul of wit: Douglas Legler. A man whose obituary was shorter than his name. The Special Collections Division at the Nashville Downtown Library serves as a repository and research center for historic Nashville materials. They have a substantial catalog of the Tennessean, the principal daily newspaper in Nashville, on microfilm. With the help of a librarian, I loaded up the roll of microfilm of the March 31st, 1995 publication of the Tennessean. The Social Security Death Index on Ancestry.com records the death of John Paul Jones on March 30th, 1995. One day later, his obituary was printed in the Tennessean. He worked at the Southern Publishing Company from his early 20’s until the day he retired. He and Juanita had no children. Woodlawn Memorial Park is one of the largest cemeteries in Nashville and is the final resting place of many of our Country Music stars such as Tammy Wynette, Little Jimmy Dickens and, most recently, George Jones. The office will provide you with a printed map of these legendary singers and songwriters if you want o make a day of it. Other notable Nashvillians include Rob Bironas, kicker for the Tennessee Titans and Owen Bradley, the father of the famous “Nashville Sound”. As the Italian’s say, once the game is over, the king and the pawn go back into the same box; Woodlawn is also home to over 12,000 people who have never won a Grammy or broken several major NFL records. While there’s no mass-produced map printed for those souls, the wonderful staff at the Woodlawn-Roesch-Patton Funeral Home made one of John Paul Jones, especially for me. John is laid to rest in the Companion Garden C, next to his wife of 57 years, Juanita Pipkin Jones. The day was clear and bright and although the temperature was hovering around 45 degrees, the sun was warm and it wasn’t uncomfortable to sit for a spell. I brushed away the leaves on the grave markers and settled down on the grass in front of them both. My Grandad on my mother’s side died when I was very young, and although I have faint, shifting memories of placing a wreath on a grave, I don’t remember much. I was a little older when my father’s dad passed after fighting Leukemia for many years. Both my Nan and Grandma died after my family had moved to the States, and although my parents were able to attend the funeral, I could not. I have no family graves of my own to visit, except now I have John and Juanita Jones. 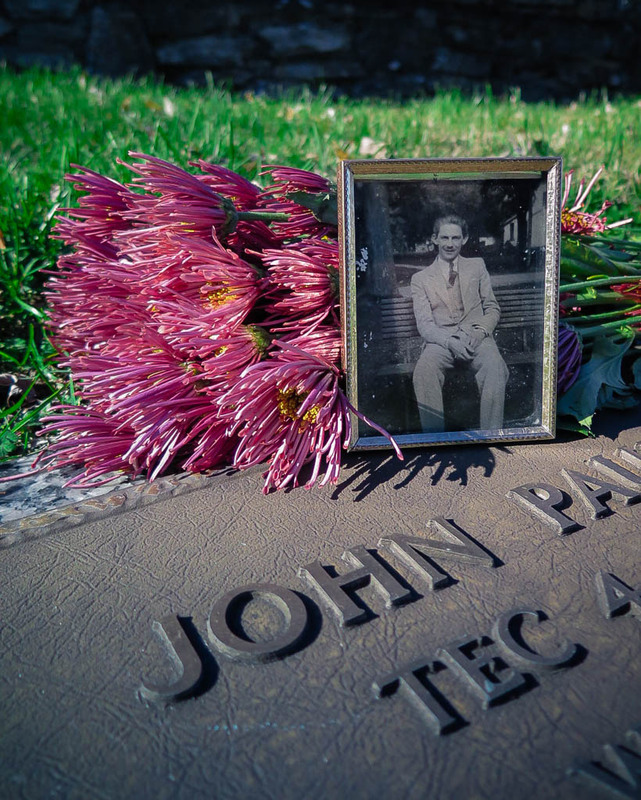 Not knowing he was buried next to his bride, I had only brought a picture of John to place on the grave marker. The staff at the funeral office told me that the groundskeeper would throw it away if I left it, so I temporarily propped the picture up on the flowers I had brought. I had enough to share, so I broke the bunch in two. I sat with them in the sunshine. I introduced myself. I asked them questions. I cried. I tend not to think about death very often. I’ve only been to one funeral in my life, the funeral of my Gentleman Caller’s father. I feel completely unprepared for the death of a loved one…not that anyone ever can be, I suppose. As an adult, my brushes with death have been almost nonexistent – no family members, no pets I’ve considered my own. I worry that when it does happen, I will be completely destroyed with the loss. Neither my sister or I plan to have children. My parents will never be grandparents, and I am sure that makes them sad. It makes me sad! Not sad enough to want children, but sad for the collapse of our family stories. The precious photos we do have, my Nan’s ceramic zebras I inherited, my Grandma’s charm bracelet…where will they go? Who will want them? Perhaps I will put them in a suitcase. Saxon, A. H. (1989). P.T. Barnum: The Legend and the Man (rev. ed.). New York: Columbia University Press. p. 326. ISBN 9780231056878. Retrieved June 30, 2015. My genealogy research was recently questioned on the basis of an obituary. Having done extensive research on this family, I surmise that whoever gave the obit information was not up to snuff on the family. From the facts given, it appears this George was combined with his uncle George as there are combined facts for both Georges in the obit. An obituary is no more accurate than the person who gave the information. Death certificates have mistakes. Grave stones have mistakes. Obituaries have mistakes. Toni, that must have been very frustrating. Fortunately, I can corroborate most of these details from other sources. Juanita died ten years later, so I am assuming that this information was given by her at the time of John’s death. Was nice to sit here this morning and read at my leisure the continued story of John Paul. I loved the photos and your thoughts. I have a feeling this is far from the end of the story. Who knew what a journey this would be–just because a little suitcase called your name! You were the chosen one I feel as I can’t think of anyone else that would have done this extensive research–time and money. Something was pulling you and driving you do to this and I thank you. Death is dealt with in many ways and so differently. I do not fear death, but will see it as another adventure. My sons know this and are both relieved and amused. I take a different view as I have the genetic disease, Huntington’s in my family line. Now, I am 66 and didn’t inherit the gene, so please rest your mind on that. But, for most of my life, I lived as a time bomb–not knowing-and wondering if each day meant that clock had ticked me closer to a long horrible death. There was no way of knowing and the test for finding out if you had the gene didn’t come until 1993 when I would turn 45 and my brother and sister had already died at ages, 43 and 44, respectively. I had felt I was “OK”, but you never rest and any jerk of foot or spilled cup of coffee or slight stumble brought the fears back. To be 100% I was OK, I did take the test (and out of State) to avoid issues and not to add to my Insurance. I knew even if I back negative for HD,, the insurance companies often dropped people with any genetic background like this. The test is a simple blood test (only after you can prove to them you won’t committee suicide IF it is positive) , but the worry of waiting to see if you have a doomed life or not– is indescribable and then the pain of living with survivors guilt is far worse than most think. Enough of this. Just to say I don’t worry about death. Live each day now. Keep doing YOUR wonderful writings and going on adventures… You have fans waiting for next story! Judy, thank you so much for sharing your story. I am glad you enjoyed the blog…and you are right, it’s far from over! I found out some exciting new this week about Juanita that I can’t wait to share! Today’s post touched my heart more than once. As a Find A Grave volunteer, I would like to see EVERYONE who has gone before us memorialized in some way. You have done that and so much more for John Paul Jones. He is alive in the hearts and minds of all your readers. One aside if I may. As a genealogist of more than hmm hmm 30 years, I don’t consider an obituary a primary source. As you pointed out, they can be as colorful (i.e. fictional) as the writer deems appropriate. But they are often filled with valuable clues. As a researcher, you did a fantastic job of combining clues to prove or disprove your suppositions. Thank you for honoring John in such a loving and caring way. I’m so looking forward to your exciting news about Juanita! Laura, thank you so much for those kind words! I’ve been reading this goofy genealogy book that talked about obits as primary sources, but of course you’re right! I think that’s book is being set aside. I’m definitely a rookie at this, but I’m completely hooked. I am attempting to set up a filing system this weekend because I can’t keep it all in my head any more! I also wanted to know if you were able to contact the niece in Orlando, Fla.? Or is this a later post? Why do you think the phrase on her (Juanita) tombstone read “beloved wife and sister”? I was wondering about that. Was she also like a sister to him, as well as wife? 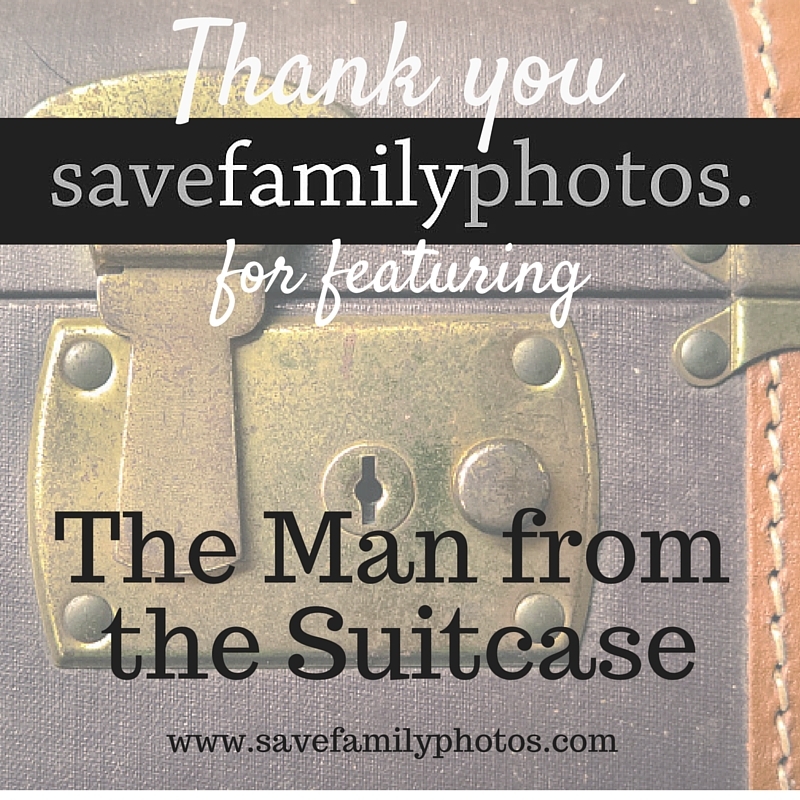 Wonder who was responsible for the estate sale or just the giving away of things–including the suitcase. If you had found it 10 years ago, then someone didn’t seem to waste much time in disposing of things. I know I don’t have all the clues and there may be excellent reasons for it all. Also, I agree about not trusting obits. Too many family secrets are still covered up and info printed as the truth. Children are not always biological children or they may have been a granddaughter/grandson raised as their own child. And not always born where the obit says. People are left out–old feuds sometimes never die. Some of this I can truly speak from experience or do personally know of this happening. Obit is good place to start, but think of the ‘what ifs”. I still keep checking back here for any updates! I have not lost any of my original interest, but just the holidays put things on back burner for a bit. Hope 2016 will be the best year ever for all of us. Judy, I am currently working on a post about Juanita…it’s been hard putting this one together, but it will be out by next week! Thanks for reading along!